I thought that it would better to write about this topic some time in the future because I was not able to attend, but WHEN THE AXÊ CALLS YOU TO WRITE A BLOG POST, you answer. There were some videos of decent quality released recently on different parts of the event. I have no idea if there was any professional videography done, I really hope there was, but if not, at least we had many people out there with their gopros, their iphones, and their own professional equipment documenting the event. 50 years of Cordão de Ouro! 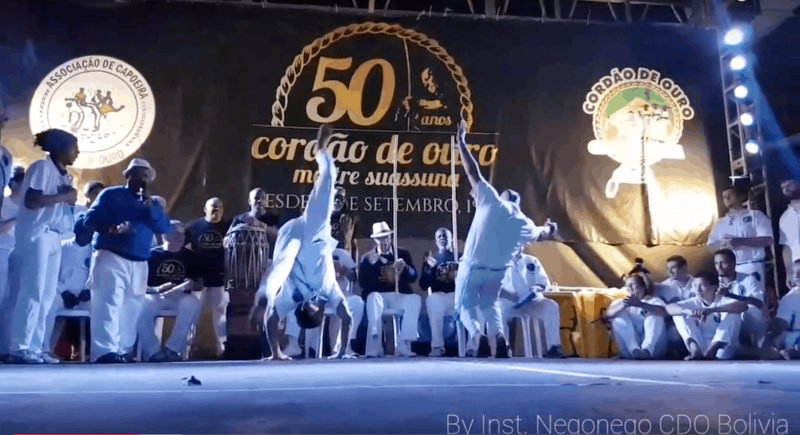 The 50th year anniversary of when Mestre Suassuna and Mestre Brasília created Cordão de Ouro, today one of the biggest and well renowned Capoeira groups in the world. From 1967 to 2017, amazing! Back in the states, only a few videos have come out and I wanted to highlight a couple that I thought captured some fantastic moments. In case you didn’t know, being openly gay in Capoeira is a new thing. The level of acceptance for a part of the LGBT spectrum is generally very low in Latin America in general, and Brazil is no exception. Having said that, the new generation is showing us the way. A few budding instructores and professores have come out openly as gay, which is a pretty big deal for Brazil. During the Formatura for new Professores, instructor (now professor) Mussum, came out onto the stage waving his gay pride flag and placed it down on the floor of the stage before he played Mestre Esquilo for his professor chord. The crowd was supportive, cheered him on, and it was pretty cool to see that level of acceptance from the Capoeira Cordão de Ouro community. Not sure why there was a child receiving a belt at the formatura. This kid was very talented, but obviously wasn’t receiving a professor chord, so if someone has some answers to this please let me know in the comments below. This has no time stamp. Something that I thought was pretty amazing is how many women are getting into Capoeira for the long haul. In the old days, it probably would have felt like you could count the number of women in Capoeira on a single hand. At this formatura, I was amazed at how many women were receiving their professor(a) chord. Watch the video for more than 5 minutes to see what I mean. 79 YEAR MAN OLD FLIES?! I’ve seen and heard some pretty ridiculous things about martial arts masters over the years. Some claim to have kinetic powers, some claim to be so deadly they can’t enter in martial arts tournaments, whatever. At the same time, there are some pretty incredible stories that are true, such as Helio gracie wrestling in his 90’s. As far as Capoeira is concerned, Mestre Suassuna, who is now 79 years young has proven time and again that age is just a number, but this time he took things pretty damn far. I didn’t know our mestre could fly, but fly he did. What things should you look for as your teachers and friends come back from Brazil? Jams! New songs are being written all the time and I’m sure there are some new songs that were a big hit at the event. Ask people about what songs they heard so you can incorporate it into your group’s top 40 hits. Movements! After hours and hours and hours and hours and hours of workshops and games, people are bound to come home with tips and new ideas. Make sure to ask your teacher what their experience was like, what they learned, and what they thought was interesting that they want to bring back to class. Videos! If you’re a Capoeira geek, then you love watching amazing Capoeira games, and I’m sure if you type “Dia de Ouro” into the youtube search bar in a couple weeks, you’ll get some pretty awesome stuff – enjoy!